So you have a tree that needs to be trimmed, and your handheld pruners just won’t cut it – both figuratively and literally. What should you do? 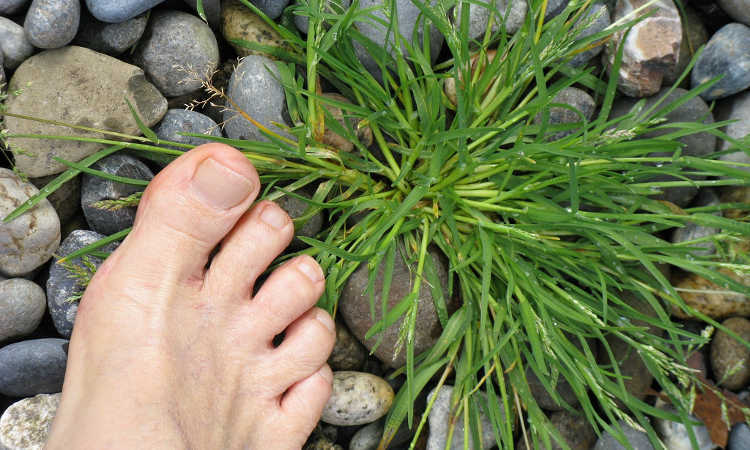 Invest in a quality pair of loppers, of course! But how do you decide what you need, and is there really any differences between them? Let’s discover all you need to know about loppers, and I’ll make some recommendations for specific brands. If you just want the recommendations, here they are. Otherwise, let’s dig into loppers! Handles are extendable: extends 27 1/2" To 37 1/2"
Before we get into the individual items themselves and their functionality, let’s focus on what you need to know before you buy loppers. There’s a lot of variables to take into consideration. Garden loppers typically have an inward-curved lower jaw and an outward-curved upper jaw. 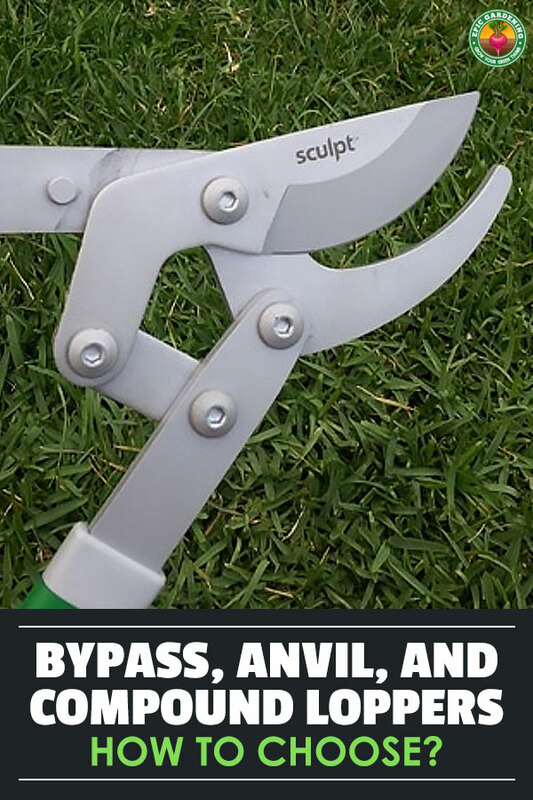 But there’s two major types that you can choose – bypass or anvil loppers. The most popular, bypass loppers, have an upper cutting blade that slides past the lower fixed jaw in a scissor-like action, hence the term “bypass”. 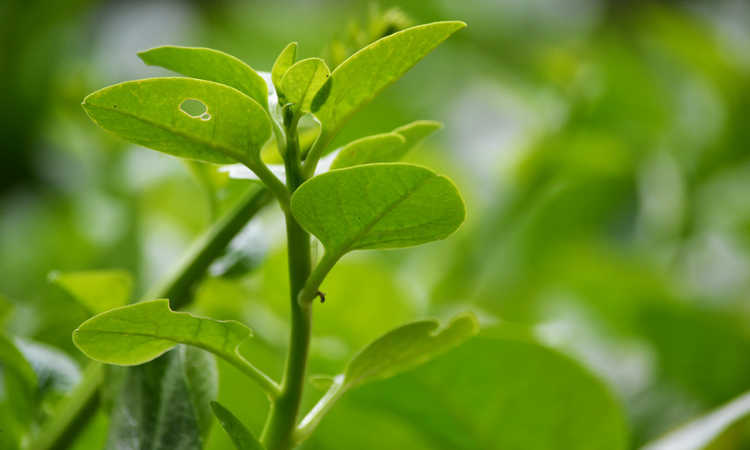 They provide a clean and even cut that heals quickly on live plants. One drawback is that if there’s any looseness in the bolt that holds the lopper together, smaller materials can get jammed between the blades and make them difficult to open or close. Anvil loppers have an upper cutting blade and a lower notched jaw on which the upper blade strikes. These provide excellent leverage for harder materials. 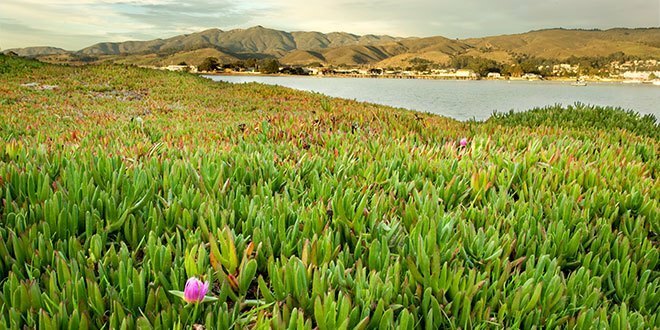 The resulting cut may not be as clean and neat, and it can cause crushing or marking on the plant’s bark, so it’s recommended mostly for use on dry wood. All blades can offer cutting capability, so let’s look at the pros and cons of each kind. High-carbon steel is heat-treated for strength. It tends to provide more durable blades in the long-term, much less likely to break or warp. 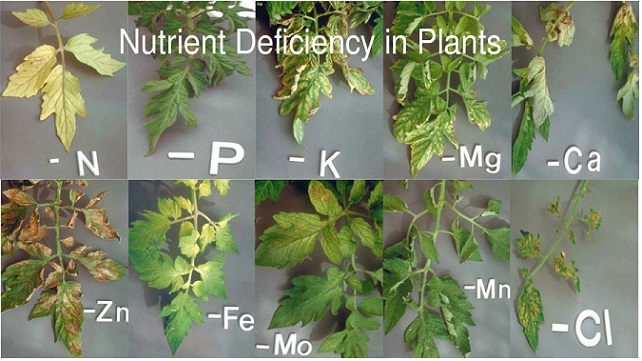 However, steel is also prone to rust issues. You have to keep your loppers clean, well-oiled, and free of residual sap and moisture. Steel blades that aren’t heat-treated can have advantages as well. Some are treated with a coating which prevents rusting of the blade or provides a slippery surface that glides the blade through dense wood easily. 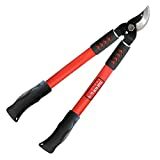 Because they’re not heat-treated, trying to cut too hard of a branch may bend or break the blade. Either way, you need to maintain your blades. 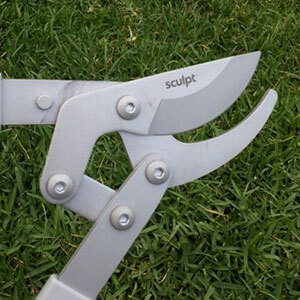 Here’s a short video on how to sharpen blades and do maintenance on your pruning loppers. You will want to keep them well-cleaned, well-oiled, and rust-free. Loppers have four basic mechanism styles. Traditional loppers are very simple. 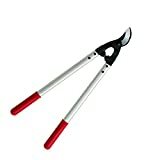 When using these, you close the jaws around the branch and use your arm strength to cut. These have no mechanical assistance, so they require arm muscle to use. With ratcheting loppers, every time you close the handles, the ratchet clicks and provides extra pressure on what you’re cutting through. With a few pumps and clicks, the pressure exerted will increase and help cut through thicker items. 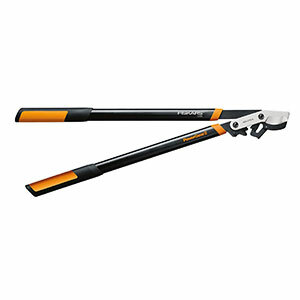 Ratcheting loppers are recommended for those with limited arm strength. Compound action loppers have a special lever and pivot-point action which, like the ratcheting varieties, helps to exert extra pressure. These are sometimes called lever-action loppers as well. Geared loppers have a gear set just below the cutting blades. When the loppers are opened and put around a branch, the gear compounds the cutting power. However, you have to open the handles wide and set it in place before trying to close and re-engage the gears, so it can require more space to use. The longer the handle length, the more unwieldy loppers seem. However, longer handles mean that you can reach difficult areas, like branches overhead or the tops of larger bushes.. You should consider what types of job you’re likely to be doing before purchasing loppers – if it’s for trimming trees, longer-handled loppers are probably better, but if it’s for dealing with lower woody growth or already-cut branches that are within arm’s reach, you can opt for a shorter set. Can’t decide what handle length to get? Some brands offer telescoping handles so that you can set them to the length you would prefer. As with any benefit, there can be a downfall – telescoping handles are tubular rather than solid, so they may be bent or warped more easily when cutting thicker wood. However, they’re also typically lighter in weight, which is good for people with less arm strength. Be sure you can securely lock the telescoping handles at the height you want! There’s many different grips available on loppers. In ergonomic grips, the grips are intended to provide an intuitive placement for your fingers and provide a good grip. However, they can sometimes be slippery. Comfort grips provide lots of padding and are less slippery, but the material may become compacted or damaged with use. The choice should be based on your personal preference. If you can maintain control of your garden loppers, you’re fine. For bypass loppers, there is an added part: bumpers on both of the handles which prevent the handles from going too close together. While some anvil-type loppers also have bumpers, they’re purely aesthetic as the anvil blocks the blade from closing too tightly. If you have one of the more expensive varieties of loppers, it’s likely that there’s replacement parts available. It’s best to keep spare blades on hand if you can so you don’t have to go find any mid-job. But less-expensive loppers are often made to be replaced rather than repaired, and may not be easily disassembled. If you would prefer to maintain rather than replace, be sure your chosen brand and make has replacement parts available before you buy. As with anything which you may have to hold over your head or out in front of you, weight is important to consider. Anything too heavy will feel unwieldy, and your arms will tire faster than with their lighter counterparts. But anything which is too light may be subject to weak points, and may break or bend. What exactly do you need to cut? Finding the answer to that question will help you determine the loppers you’ll need. For most general purposes, something that is rated to handle items 1”-1.5” in diameter is fine. Older growth that’s 1.5”-2” or greater will require more leverage, more strength, and possibility the use of the mechanical power from a ratchet, gear, or compound action to successfully cut all the way through the wood. 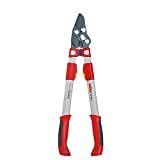 Manufactured in Switzerland, Felco loppers and pruners have replaceable hardened steel blades, and generally have lightweight aluminum handles to reduce operator fatigue. While they can be pricey, their tools hold up to the test of time. Corona has been producing loppers and other hand tools since the 1920’s, and is a tried and true brand. There’s a full line of replacement parts for Corona loppers, so you’re able to replace anything that might get broken or go missing, and they have a wide selection of types to choose from. Fiskars is a well-known company with a full garden tool line. Fiskars loppers come in a wide variety of blade types and a multitude of lengths, and replacement blades are widely available. Their comfort grip varieties are quite popular. The best blending of economy, design, longevity, and function can be found in the Corona SL 4264 or 4364 DualLINK. Available in both fixed and extendable handle types, with a full range of all replacement parts available, and with a reasonable price, this compound-action bypass lopper provides a long-term solution with a serious power-assist. They weigh 3.8 pounds, so they’re a manageable weight. Overall, these provide great quality for a very reasonable price. If all you want is a good, sturdy pair of bypass loppers, the Tabor Tools GL18 20-Inch Bypass Lopper is a solid choice. 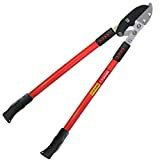 These no-nonsense standard loppers offers hardened steel blades with friction-reducing coating, sturdy handles, and textured rubberized grips. It is by no means the fanciest lopper on the market, but it works extremely well for what it is, and the price point is excellent. In the same vein as the bypass category, the anvil category also goes to a Tabor piece – the Tabor Tools GG12 Compound Action Anvil Lopper. With the added boost of a compound action, these anvil loppers bite right through hardwoods up to 1.25” and softwoods up to 2”. As always, anvil loppers are best utilized on dry woods, and these will do the job for a very reasonable cost. The Spear & Jackson 8290RS is a durable ratcheting anvil lopper with a carbon steel blade coated in PTFE for rust reduction. At 4.35 pounds it’s not the lightest set of loppers, but it makes up for that with a 10-year manufacturing guarantee and its great ratcheting action. Made specifically to power through thicker, denser woods with ease, these also come with telescoping handles to add a little extra length for leverage. Professional quality, the A.M. Leonard Compound Action Bypass Loppers offer a 2.125” cutting capacity with heat-treated blades and aluminum handles. But that does come with a price, as these are the most expensive loppers on our list. Still, the added force of the action is worth it, and they make quick work of thicker underbrush or overgrown branches. The Fiskars 32 Inch PowerGear2 Lopper comes in at the top of the geared category. Fiskars’ proprietary gear system offers 3x the cutting strength and slices right through branches up to 2” diameter. It can handle almost anything the jaws will fit around, and they have a comfortable grip. Their price is low and economical, and they have a limited lifetime warranty. But there are a few cons. They weigh in at 4 pounds, which can be a hefty weight to work with for long periods of time. While their blades are coated in a friction-reducing material which helps with the cut, they aren’t heat-treated and thus can break if the loppers are turned wrong. 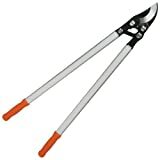 Finally, you need more room to work these than other loppers, as the gears do not properly engage if the jaws aren’t opened wide enough before making the cut. Overall, they rank very high in this category, but mid-range overall. Most telescoping handles tend to have a cinching ring that is tightened to secure the handles at the length you want them. 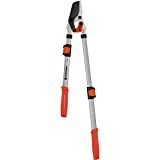 The WOLF-Garten Power Cut Telescoping Bypass Lopper surpasses others in this category simply because their handles have a full pin-locking mechanism to ensure they won’t shift position while you’re hard at work. The blades are German steel, and they weigh in at 3.86 pounds in weight. However, they cannot be taken apart, and do not have replacement parts available. But they can be sharpened and maintained, so take that into consideration before you buy. While not the cheapest loppers on the market, the Felco 200 Bypass Loppers can easily beat out many other varieties. 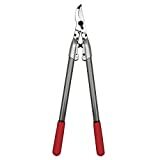 These are a standard bypass lopper, so they don’t provide much by way of enhanced mechanical cutting strength, but they make up for it in durability and ease of use. 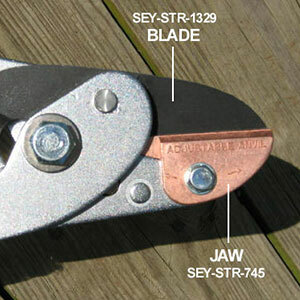 The hardened steel blades maintain an excellent cutting edge, and can be sharpened. They have a micrometric blade adjustment feature which helps keep the blades perfectly aligned. The biggest issue is the price, which is higher than most others on the market. Made in Japan, the ARS Orchard Lopper, LPB-30M is a surprisingly lightweight option for those doing a lot of regular orchard maintenance. At only 2.1 pounds, these can be used for long periods of time with ease. Like the Felco, they have a larger price tag than other brands, but they offer another quality standard bypass lopper option that will last for years. I personally chose the Corona DualLINK because of the availability of replacement parts from a long-established company, as I prefer to maintain rather than replace. 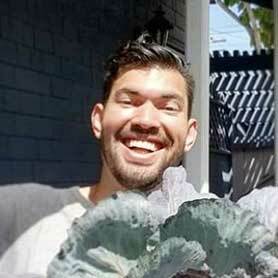 Further, I’m going to be trimming live plants and trees, so I need a bypass lopper rather than an anvil lopper to reduce the risk of infection to my plants. The quality is fantastic for its relatively low price. And finally, it delivers a mechanical assist in its compound action. Depending on what you’re trying to accomplish, your needs may vary, but the Corona would be a good first lopper for the average gardener, and with maintenance it might be the only one you’ll ever require.